Tresorit is a European cloud solution offering 100 GB storage from €10 per month. Tresorit is a European cloud storage provider operating under Swiss privacy laws and focusing on their end-to-end encryption. The company has invited over 1.000 hackers to crack their security which so far has yet to be broken. Their end-to-end encryption is what sets Tresorit apart from cloud services like Dropbox and Google Drive. While they also encrypt the data they also have access to your files. Second thing that seperates Tresorit is the fact they only use datacenters in the European Union (Ireland and the Netherlands). Many other cloud storage companies (e.g. Dropbox, Google Drive, SugarSync, SpiderOak) listed on our website (also) use servers in the United States. Their cloud solutions are divided into Individuals and Teams. For personal use an individual account can be used starting at €10 per month. Business users can start at €12,50 per month per user. When you are looking for a cloud storage solution for one user only you can choose between an Individual Premium or an Individual Solo subscription at Tresorit. The Premium account is cheaper at €10 per month (€8,33 billed annually) and offers 100 GB of storage, access up to 5 devices, version recovery up to 10 versions and 2-factor authentication. 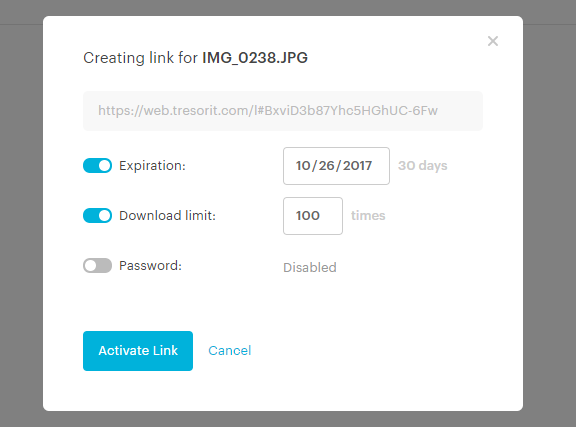 When you need more storage the Solo subscription offers up to 1,000 GB of storage, unlimited version recovery, 2-factor authentication, permission control, file sharing with password and outlook integration. For businesses Tresorit offers Team Accounts, the smaller companies can start a Small Business suscription from €16 per user, larger organizations with 10 employees or more can opt for the Business account for just €10 per user. Both accounts offer 1,000 GB online storage per user and a wide range of options including Unlimited version recovery, Unlimited activity history, File sharing with password-protected links, 2-factor authentication, Outlook integration and more. Starting with Tresorit you discover that the word Tresor is used for your secure folders. The word Tresor is German for safe or vault and is therefor very adapt. The interface is very smooth and soft similar to other cloud services like Dropbox. It is very nice to see how you can share a folder or file with a link and at the same time control that action. That means you can set an expiration date, a download limit or a password. After doing this the file or folder can be shared with a simple link. Even though the online ‘web’ environment works very smooth there are dedicated apps available. For desktop there is an app for Windows/MAC and Linux. For Mobile there are apps for Android/iOS/Windows Phone and Blackberry. The nice thing about Tresorit is that the focus on control and security is even larger than most other cloud solutions. The fact that this is a European company storing your data in Europe also seperates it from the big international (American) players. While Tresorit mainly target companies as their potential clients also single consumers can pick a very competitive solution with enough storage and options to work with. Overall we are very impressed with their product so far and are interested to see user experiences from active users.